National police spokesman Patrick Hamon said there was a "considerable decrease" in the number of incidents overnight into Tuesday in the Paris region. Wishful thinking. Even if the riots are dying down in the French suburbs, they are continuing to spread, now reaching 300 towns, and increasing in their intensity, sophistication and the damage they're causing. The government cannot admit it, but more and more voices in France are being raised to say that the country's worst urban unrest since the student uprising of 1968 reflects the failure of a whole model. The French modèle républicain d'intégration holds that all citizens of France are equal, even as the riots prove that some citizens are more equal than others. How many are more equal? How many are less? We don't know because the French model does not allow the government to consider differences within the French population. There is no count of Arab-French or African-French vs. French-French, no comparative economic data, no comparative education data, no comparative sociological data. This is why the French coverage of the riots has been so devoid of mentions of the ethnicity of the rioters. It is unfrench to call them anything but French. But the rioters don't feel French. In fact, they don't even like French. 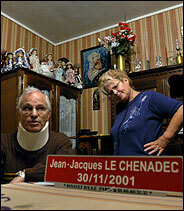 Here's an NYT picture of a man who was beaten with Jean-Jacques le Chenadec, the riots' first fatality. The woman on the right is Jean-Jacques' widow. Note their ethnicity. The rioters certainly did. Just they noted the faith practiced at the churches they burned down Monday night -- Christian churches being burned by Muslim rioters. Cherac's comments aren't simply a hand-wringing Liberal response of the sort that followed the Watts riots in the US. They come from a long ingrained faith in the superiority of the French social democratic model, a faith that is so strong that it has survived multiple domestic and international failures. As long as France believes that if only its revered model is applied to the immigrant ghettos all will be well, all won't be well. The model won't fit there because the French economy can't stretch that far, and after these riots, neither will the heart of the French-French majority. "[The French] approach to integration, based on the concept that everyone is equal, is part of the problem," said one analyst, Christophe Bertossian. "The idea that we are equal is fiction. Ethnic minorities are being told they do not exist." "The people who live [in the immigrant ghettos] live next door to France," said student Yasser Amri, a third-generation immigrant.... "The republic deals with citizens, not with individuals. But we're not citizens. We don't know what we are. Not Arab or west African, but not French either. We're unrecognised and unremembered. No wonder people rebel." Here's the best scenario: The riots will shake the French into recognizing their difficulties and confronting them straight-on, without the silly, contrived politics and language of unity (i.e., "French youths continued to riot..."). Things will calm down and very slowly get better. Here's the more likely scenario: French government will be paralyzed because it is made up largely of veterans of the student riots of the 1960s. Some French-Arabs will give up on the system and become more self-reliant, beating the system. But others will give up on the system and become a permanent rebel class far more dangerous than our aging civil rights and anti-war activists, because they will get their support from al Qaeda. Could Muslim Riots Start Here?